PHP Programming Language Are You Ready to Know All About PHP? Today only, get this Kindle Book for just $8.99. Regularly priced at $11.99. Read on your PC, Mac, smart phone, tablet or Kindle device. Learning a programming language is not an easy work. It requires time, money and desire. You must search an academy or a teacher, achieve coordination with them, or worse, adapt your own time to their class times. You also have to pay the high fees, month to month, and what is even more annoying is this: you will probably have to go to a special place in order to practice the new programming language! I made this crash course for a reason… I made this course to give YOU a solution. This crash course about PHP programming is not only going to teach you the basics of PHP in a didactic way, furthermore, you will learn PHP language WHEN you want, and more important, WHERE you want (It could even be at your home!). I made this crash course to show you HOW you can learn PHP FASTER than you ever thought possible. I will teach YOU step by step the PHP Language extremely quickly. I will TAKE you through a step by step guide where you simply can't get lost! This course-book will allow you to practice, learn and deepen your knowledge of PHP as a new programming language in an entertaining, interactive, autonomous and flexible course. Stop procrastinating and start NOW! Learning the PHP Language is something that is a really worth investing time. Here Is A Preview Of What You'll Learn When You Download You Copy Today:Introduction to PHPIntroduction to VariablesRulesVariable Types and TypecastingIntroduction to Expressions and OperatorsControl StructuresFunctionsDatabasesWhat is an API?PHPMyAdmin and getting familiar with MySQLForm DataSessions and CookiesFile HandlingObject Oriented ProgrammingAnswers to ExercisesMuch, much more! Download your copy today! 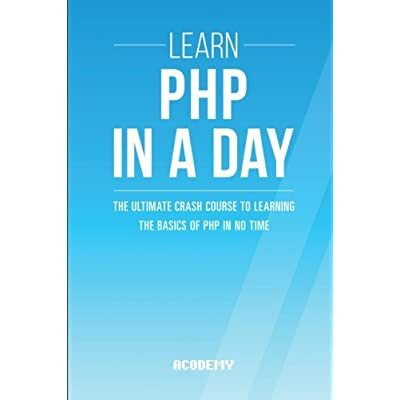 The contents of this book are easily worth over $11,99, but for a limited time you can download "PHP: Learn PHP Programming FAST!" for a special discounted price of only $8.99 To order your copy, click the BUY button and download it right now! Acodemy. © 2015 All Rights Reserved PHP: Learn PHP FAST! - Learn the Basics of the PHP Programming Language In No Time Remember: Investing in yourself is the most important thing to do! ------- Tags: PHP, PHP course, PHP book, PHP programming language, PHP book-course, PHP Programming.